Situated in the tourist area of Costa Adeje, the hotel is close to the sea front and the Puerto Colon marina, which is a very exclusive and nice part of Tenerife. There are plenty of restaurants and bars nearby, as well as shops and cafes. The nightlife is also not too far away. 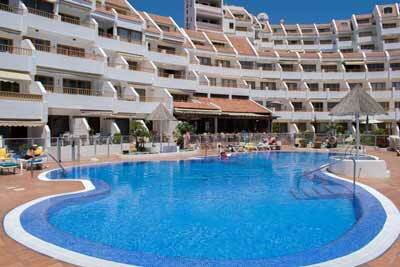 The complex is only 100 metres away from a large shopping centre, which includes a Mercadona supermarket. As Tenerife is a duty-free island, drinks and meals are very reasonably priced. There is an outdoor swimming pool, which is heated during the winter months, with children section. The hotel offers foreign currency exchange, 3 lifts, 24 hour reception, baby sitting services, safety deposit boxes, nearby pay to park, medical service. Regrettably, pets are not allowed in the hotel. The hotel is located 300 metres from the beach, 450 metres from Pueblo Canario, 100 metres from the resort centre and the nearest bus stop and 17 kilometres from Tenerife South airport.